I admit, it's extremely rare you guys see me wearing colorful looks, I'm addicted to neutrals and my closet is almost all gray, beige, black and white but the red has been always my favorite vivid color. I remember when I was a kid I had a red skirt and whenever my mother asked me what I wanted to wear I always said 'the red skirt'. I don't wear this suit as often as I should but when I wear it I feel more confident and willing to risk. It's funny to see how the colors and the clothes we wear can change our way of being and the mood on that day. Lots of kisses and happy week! Admito, é rarissimo verem-me com looks muito coloridos, sou viciada em tons neutros e o meu armário é quase todo cinza, bege, preto e branco mas o vermelho sempre foi a minha cor viva preferida. Lembro-me de ser pequenina e ter uma saia vermelha e sempre que a minha mãe me perguntava o que queria usar dizia sempre 'a saia vermelha'. 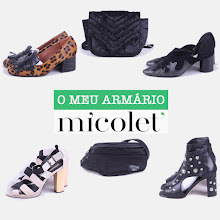 É raro usar este conjunto mas quando o uso sinto-me mais confiante, decidida e com vontade de arriscar. É engraçado ver como as cores e as roupas que vestimos podem mudar a nossa forma de estar e até o humor nesse dia. Muitos beijinhos e boa semana!